Home Automation - The New Thing?? "Home Automation" - The latest buzz word of the world it appears. If you haven't heard much about it you likely will soon. With Apple jumping on the band wagon just maybe the general world population will begin to see and use the "smart home" technology that many of us have taken for granted for years. Hearing about "cutting edge" home automation apps that text or email you when things like burglar alarms sound or doors open around you home when you're away sounds so cool... and they are, they just aren't so "cutting edge" to me. We've had such notifications for over 15 YEARS from our house. I'm not alone, Home Automation has been around for decades, it's just now maybe starting to go main stream. Heck I had my old VIC 20 computer turning lights on and off while we were away from home in the middle 1980's so not much is news to me. 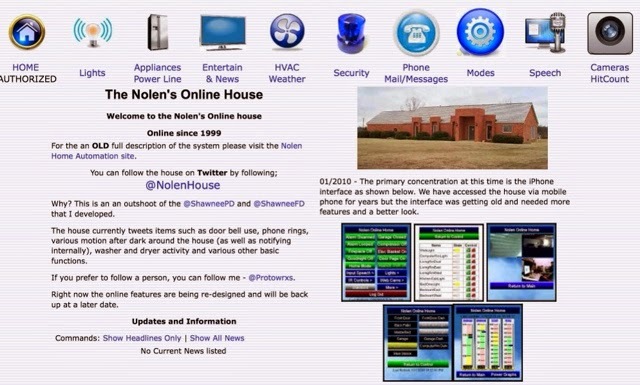 In fact our home has been online and accessible through the Internet since 1999. Of course most of this is very DIY or very expensive to have someone else build it for you but the concepts have been there for a long time. The ability for your house to check if the garage door was left open late at night and close it for you, to let you know when the burglar or fire alarm goes off, to automatically turn certain lights on or off when a car pulls up or someone wanders around your yard are all things I've almost taken for granted anymore. Seriously though, part of my issue with the current "Home Automation" trend is calling it the wrong thing. Such things like turning a light bulb on and off from anywhere with an App like the WeMo light or the Phillips Hue is cool but that's not automation, that's remote control. Of course those can be "automated" to some degree using IFTTT.com but that's not what the manufacturer is telling you. Oh well, the more hardware available the more options there are I guess. Having that Hue light bulb change colors when the garage door is open or the forecast says it's going to rain is a bit more automated. I haven't done that yet but know I how it would I would do it if I wanted to spend the bucks for a Hue. 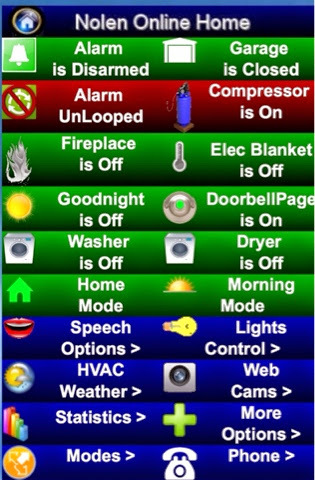 Turning off the lights and arming the alarms system when you leave the house is automation. Having the house tell you by speech that the garage door just opened, the dryer or washing machine just stopped, etc or text you when the doorbell rings is automation to me. Having the house know you're home or away based on where your phone is at, which is generally where YOU are at, is automation. Time will tell where the trend goes but at least it appears to gaining momentum and there are more and more DIY trends heading our way. Unfortunately many of them force you to sign up for some monthly service to use the features and I'm personally not in favor of that but likely many will be and maybe that is what it takes long term for Home Automation to make it to the masses. 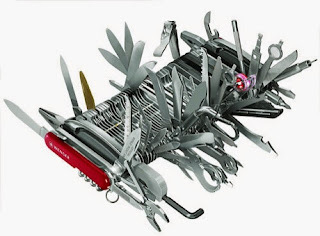 "Jack of all trades, Master of None" - I'm sure everyone has heard that quote before, and usually with negative connotations. I was once told by a mentor to never be one, to specialize to the extreme to be successful. Being one to never take advice very well I obviously didn't follow it. I remember when I was told that, my first thought was "How boring"... And I still believe that. I don't think I've mastered anything in my life. I may know some things better than many others but have not mastered them by far. I can rescue old cars and give them new life, make a fun to watch Lego stop motion movie or two.. Ok, I made a lot of them, can build a home automation system from scratch back in the 1990's before it was cool, can write dynamic web code and created a few web or cloud apps, built a working 3D printer, conceptualized and built a few entertaining robots, ok, a lot of them too... even a contest winning one. I can still free sketch with paper and pencil good enough to enjoy and remember and attempt to play guitar cords from a few different songs. I can weld good enough to repair the old 69 Mustang, design and build a go kart from scatch, and design and build a remote control lawn mower. I've heard many times it takes seven years of studying something to master it. I'm pretty sure that time line was way before the world was changing at the dramatic rate it does today. Can you really "master" anything today. In seven years pretty much anything you've "mastered" is not going to look, act or feel much like it did before. Even core trades like brick layers and roofers see changes in material, designs, and methods, and I'm betting big changes over seven years. I'm sure the saying still holds true if you want to be the "best of the best", but I've always wanted to "discover the rest" instead. Guess I'll wear my Master of None badge with a little pride and reflect on the many different areas I've learned about and enjoyed over the years, err decades. I think the key is "mastering" constant learning, and by the time you're dead and gone at least you'll have lived life experiencing and learning about at least some of the worlds great offerings.